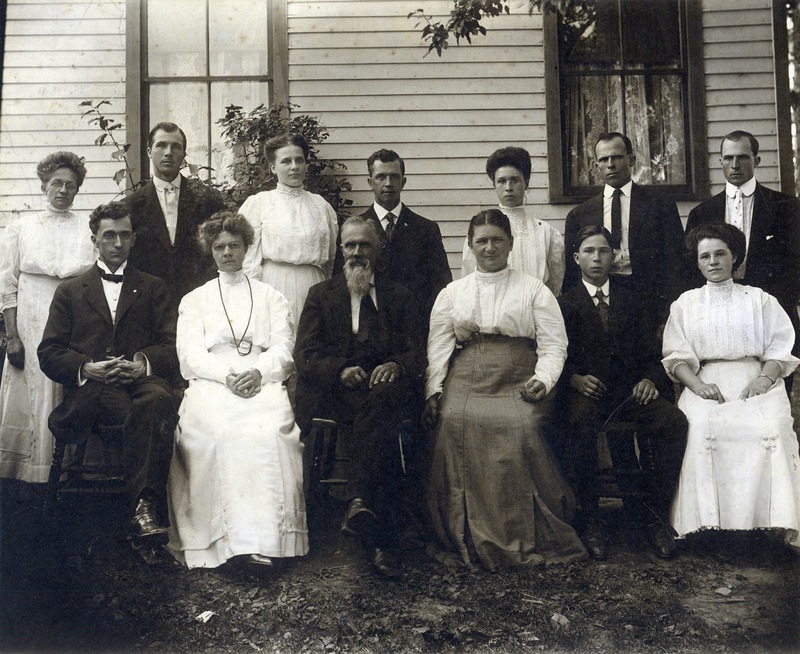 This photo was taken at a Shanower Family Reunion at the home of my great-great-grandparents Benjamin Franklin Shanower (1845-1928) and Louisa "Lucy" Leifer Shanower (1856-1916). The photo was labeled Shanower Family Reunion, without date or individual identifications. Before I scanned this copy of the photo, another family researcher had sent me a photocopy of it labeled 1899. So I had a date for it. But could I identify the people? I figured I wouldn't recognize too many of them. I thought I might find Benjamin Shanower and his immediate family, since I have other photos of them. Recognizing the hosts, Benjamin and Lucy Shanower, wasn't hard. And I picked most of Benjamin's children out of the crowd. But the appearances of a couple of those children raised red flags about the date of this photo. 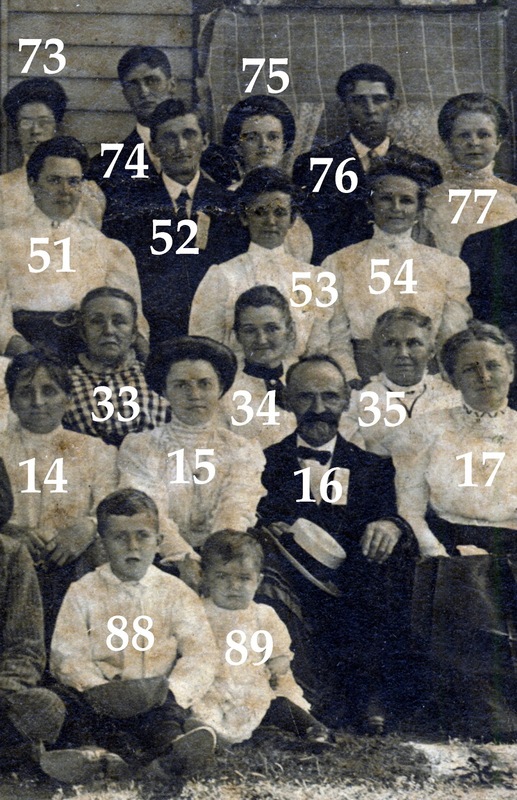 Charles Chalmers Shanower Hinman (1877-1965), son of Benjamin Shanower and Benjamin's first wife Sophia King Shanower (1841-1877), appears in this photo, fifth from the left in the second row (the first row of adults). But as I detailed in an earlier post here, Charles was given up for adoption as a child and wasn't rediscovered by his birth family until late in 1900. Or so newspaper stories reported. Was it possible that those stories were inaccurate? Had Charles been rediscovered earlier, so that he could appear in an 1899 family photo? Complicating this question was the appearance of Charles's wife, Nellie Maude Salsbury Hinman (1873-1955). In the photo, she's sitting next to him, fourth from the left in the second row. I supposed it was possible that they'd attended the Shanower reunion together in 1899, before their marriage on December 12, 1900. But it seemed odd. I also noticed Ralph Leo Shanower, the youngest of Benjamin and Lucy Shanower's children, who was born April 12, 1895. If this photo was from 1899, then Ralph would be four years old. But Ralph, who's standing on the right end in the back row, is obviously years older than four. Ralph's apparent age answered the question about Charles and Nellie Hinman's presence. The year was certainly post-1900, the year Charles was rediscovered by his birth family and he married Nellie. This photo could not be from 1899. So when is the photo from? That question was easy to answer. I had a record of another Shanower Family Reunion at Benjamin and Lucy Shanower's home—on August 26, 1909. This location and date fit. 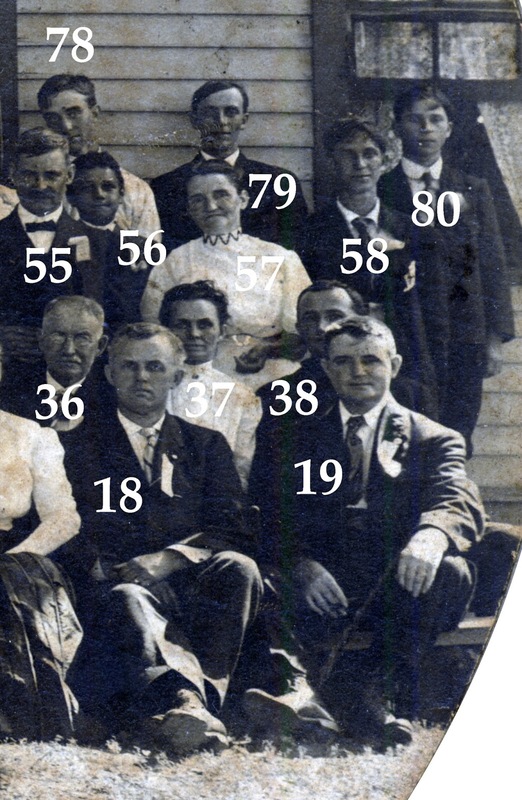 Benjamin and Lucy are at center in the second row, the logical position for the hosts of the reunion. Ralph Shanower would be fourteen years old in 1909, and he looks about that age in the photo. And Charles and Nellie Hinman had been married for nearly nine years, so their attendance together at the reunion is perfectly reasonable. The eleventh annual reunion of the Shanower family was held at the pleasant home of B. F. Shanower and wife of Claridon, Ohio, on the 26th day of August, 1909. At quite an early hour the friends began to arrive and before noon about 105 relatives were present, representing seven different states: Washington, Minnesota, Indiana, Ohio, Michigan, Kentucky and Alabama. The one surprising feature of the occasion was that for the first time in thirty years the eleven sons and daughters of B. F. Shanower and wife were together. The forenoon was spent in visiting and making new acquaintances. At noon the dinner was served on long tables under a large tent and consisted of every thing good that heart could wish. Immediately after dinner the guests gathered on the lawn in front of the house and a picture of the group was taken by Photographer Strong of Chardon. The assembly was then called to order by Pres. Simon Kandel, and the audience joined in singing “America” after which the Sec., Miss Nettie Shanower, gave a report of the previous reunion. The Historian, Mrs. Lucy Shanower, gave a very carefully prepared report. A very amusing reading was rendered by Miss Jennie Shanower, a quartette sang an appropriate song. Rev. Cooper gave an interesting address which was enjoyed by all present. The following officers were elected for the ensuing year: Pres., B. F. Shanower, Burton; Vice Pres., Amos Shanower, Wolcottville, Ind. ; Sec., Miss Nettie Shanower, Burton; Treas., N. E. Shanower, Burton; Historian, Mrs. Lucy Shanower, Tontogany, O. It was decided to hold the next reunion at the home of A. B. Shanower and wife, Tontogany, O., the last Thursday in August. Before the crowd dispersed all joined in singing, “God Be With You till We Meet Again,” and then the pleasant occasion was one to look back upon instead of forward to. The weather-man was kind, Mr. and Mrs. Shanower did all in their power to make the day enjoyable, and one and all agreed that the day was well spent. 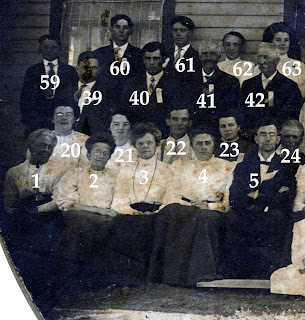 Confirmation that this photo is specifically from the 1909 reunion is the reference to the eleven children of Benjamin Shanower being together for the first time in thirty years. All except one of them, the eldest, William Benton Shanower, are in the reunion photo. Not all the "about 105" people at the reunion made it into the photo, which has 89 people. Although William doesn't appear, I firmly believe he was present that day. 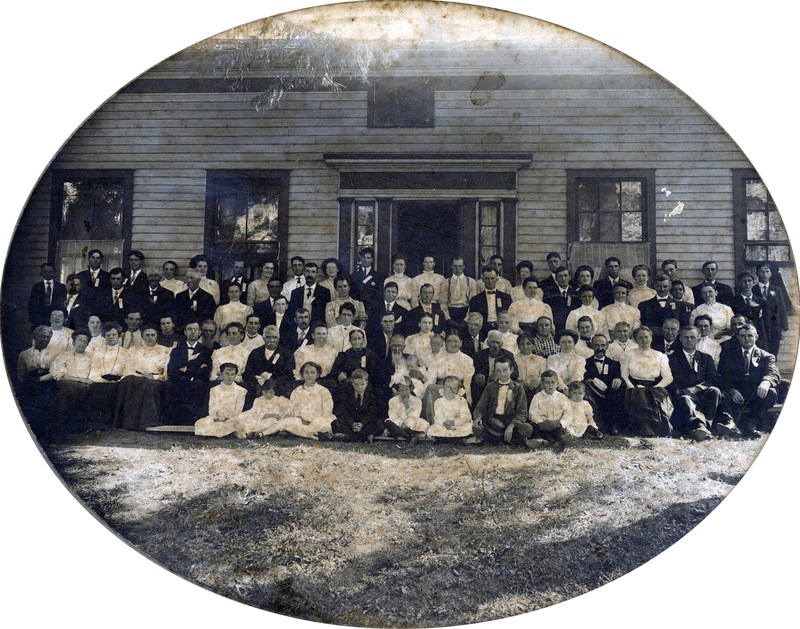 Not only does the published account say all eleven of B. F. Shanower's children were there, but I have another photograph of all those children—including William—with Benjamin and Lucy. And most everyone in that other photo is wearing clothing that looks exactly the same as what they're wearing in the big reunion photo. Among the clothing differences are: a couple of the women wearing dark skirts in the reunion photo are wearing white skirts in the other, son Frank has donned a coat for the other photo, and Benjamin Shanower seems to have put on a dark tie in the other photo. But I believe both photos were taken about the same time, possibly the same day. The Benjamin Franklin Shanower family. Seated from left to right: Charles C. Shanower Hinman, Mary E. Shanower Hostetler, Benjamin F. Shanower, Lucy Leifer Shanower, Ralph L. Shanower, Bertha A. Shanower Pollock; standing from left to right: Jennie M. Shanower, David E. Shanower, Katherine O. Shanower Phillips, William B. Shanower, Ella M. Shanower Bower, George E. Shanower, and Benjamin F. Shanower, Jr.
Why isn't William in the reunion photo? I don't know. Maybe he arrived at the reunion too late to be in it. The report mentions several other reunion attendees that I can't identify in the big reunion photo. John Amos "Amos" Shanower (1855-1934) of Wolcottville, LaGrange County, Indiana, and Nathaniel E. Shanower (1853-1936) of Burton, Geauga County, Ohio, brother of Benjamin Shanower, and Nathaniel's daughter, Nettie Oleva Shanower (1881-1977), are referenced in the report, but I can't confidently identify them in the reunion photo, although I've made guesses about Nathaniel and Nettie. The Lucy Shanower, Historian, of Tontogany, Ohio, referenced several times in the reunion report, isn't Lucy Shanower, wife of Benjamin, but instead Lucy Anne Whiteleather Shanower (1860-1942), wife of Ananias Benton Shanower (1857-1920). It's their home where the next Shanower Reunion, in 1910, was to be held. Their identities in the photo are firmly established, thanks to their granddaughter Velma Shanower Kirchner. I don't think the Reverend Cooper mentioned in the report was a member of the family. Seven states of the USA are supposed to be represented by the people in the reunion photo: Washington, Minnesota, Indiana, Ohio, Michigan, Kentucky, and Alabama. Naturally, many of the attendees were from Ohio, where the photo was taken. A number of people at the reunion were from Indiana, among them Jennie M. Shanower (1875-1942) from Elkhart, daughter of Benjamin and first wife Sophia Shanower, and Amos Shanower from Wolcottville, mentioned in the report. Mary Elizabeth Shanower Hostetler (1873-1951), daughter of Benjamin and first wife Sophia Shanower attended the reunion from her home in Birmingham, Alabama. She had three daughters by 1909, but I don't think they're in the photo. I think Mary's husband, Christian K. Hostetler (1865-1935), didn't attend the reunion either. Charles and Nellie Hinman were the attendees from Saint Paul, Minnesota. William Benton Shanower, eldest child of Benjamin and first wife Sophia Shanower, was the foreman of a stave mill on War Creek in Kentucky in 1913. He might have lived in Kentucky as early as 1909 and thus was the reunion attendee from Kentucky. A trip from Kentucky might have made him late to the reunion and that could be why he's not in the reunion photo. I can't find any other candidate to represent Kentucky. I don't know who came from Michigan—maybe members of the Tyler branch descended from Zacharias T. Shanower, although I can't identify any of them in the photo. There are probably other candidates from Michigan. I have no idea who came from Washington. So Who's in the Reunion Photo? 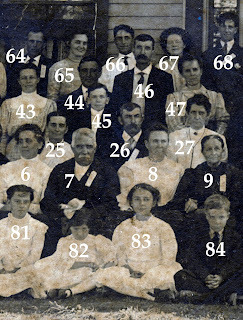 Below, I've numbered the 89 people in the photo and divided them into five sections. A numbered list for each section of photo follows that section. I've assigned names to as many faces as I can. The names without question marks are firm identifications. The names with question marks are guesses. Numbers without names are unidentified. As usual, each image in this blog can be seen larger in a new window. Simply click on the image. 62. Ruth Alma Shanower Wallace? 25. Mary Daisy Cecil Rueckert? 47. Mary Ann Shanower Cecil? or Clara Shanower Butler? 28. Floyd Allen Phillips, Sr.? 48. Wilmer Curtis "Curt" Shanower? 70. Nettie Mae Dutton Shanower? 71. Benjamin Franklin “Frank” Shanower, Jr.
72. Burleigh J. "B.J." Shanower? 74. Harry Edward "Ed" Shanower? 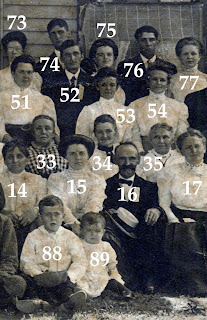 I believe the eldest person in the photo is #9, Rebecca "Peggy" Shanower Kroehle (1826-1912). She's the aunt of Benjamin F. Shanower and is seated next to him. In August 1909 great-great-great-great-Aunt Peggy was eighty-three years old and the only remaining member of the Shanower family from her generation. Thank you, cousin Linda Kress, for confirming her identity. I recognized Melissa A. Gerber Shanower, #6. Her great-grandson Brian Shanower recognized Melissa's son, his grandfather, Clarence D. Shanower, Sr., #58. So I assumed that Melissa's three other children also were in attendance. I assigned her eldest son, Harvey A. Shanower, as #40. You can read about Harvey's post-1909 adventures and compare a bad newspaper photo in a previous post here. Melissa's two youngest children, Karl and Ruth, I assigned as #61 and #62. Those are merely guesses. Benjamin Franklin Shanower has a child on his lap, #11. I assume without foundation that it's a grandchild. His only grandchild about that age in 1909 was William Henry Phillips (1909-1929), so that's my tentative identification. William Henry Phillips's mother, Katherine O. 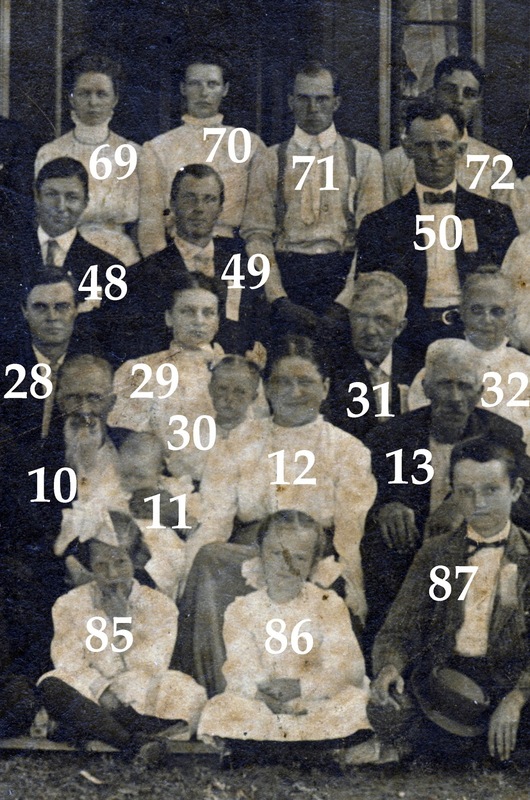 "Katie" Shanower Phillips (1886-1957), #29, is seated behind her father Benjamin. Beside her is #28, a man I've guessed to be her husband, Floyd A. Phillips, Sr. (1885-1960). There's a child, #30, on Katie's lap, but my guess that it's her niece Ruth Shanower Simpson (1905-1980), daughter of Benjamin F. "Frank" Shanower, Jr. (1881-1943), #71, and Nettie Mae Dutton Shanower (1883-1960), is tentative. So is my assignment of #70, the woman standing next to Frank, as Nettie Mae. George Edward Shanower (1879-1955), #64, wasn't married yet in 1909 to Louise B. "Lulu" Hensinger Shanower (1888-1980), but I've guessed that #65, beside him, might be Lulu. There's a photo of a much older Lulu in this recent blog post, so compare for yourself. As for assigning the name David C. Shanower (1852-1926) to #41, that's sort of a wild guess. David was a brother of Ananias B. Shanower, who's firmly identified. I thought maybe Ananias's siblings attended the reunion, too. But I can't be certain #41 is brother David. 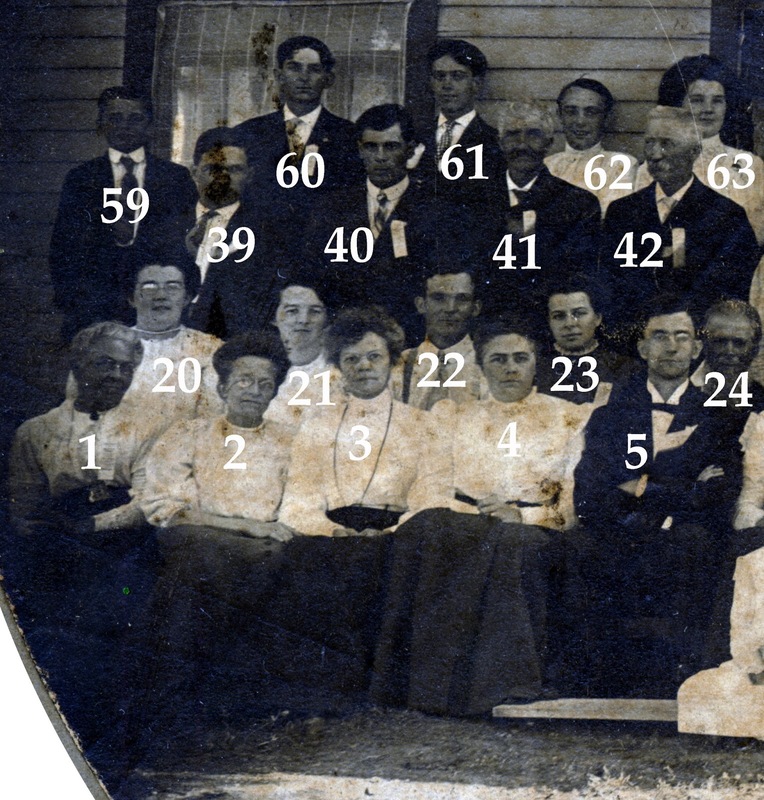 Several current family members identified people in the photo, as noted. I thank them for their help. If anyone reading this can identify anyone else in the photo, please either leave a comment below or contact me. Sorry for the dirt on the image, but that's the condition the photo was in when I scanned it and I'm no professional photo-cleaner.